Thank you so much! Your pet photo submission will help us grow our site and continue our mission of getting shelter and rescue dogs new forever homes! Visitor submissions help us to create quality content. Your photo will help us to improve the look and feel of small-breed-dogs.com as we strive to bring awareness to the plight of rescue dogs and advance their appeal! Be sure to tell us about your pet. What makes your bond and your pet unique? Tell us about how your pet came into your life, how he makes your life complete... or any story you'd like to share. We can't wait to see your dog pictures! Please keep in mind, this site is dedicated to the mission of saving dogs and advancing the opportunity for rescue and shelter dogs to find loving forever homes. Therefore, we do not link to breeder sites. Thank you in advance for understanding. Use the form below to submit your own photos. And be sure to check out a few recently submitted photos and stories while you're here! Thank you so much for helping us grow our site and continue our mission of getting shelter and rescue dogs new forever homes! Your photo submission helps us to create quality content for our site as we grow. We appreciate you!! Be sure to tell us about your pet. What makes your bond and your pet unique? Tell us about how your pet came into your life, how he makes you life complete or any story you'd like to share. Click on the Browse button to find your dog's photo. Please only upload pictures of your own dog. BREEDERS: Do not place pictures of puppies you have for sale. They will not be added. We are currently accepting all breeds for pet photo submission. Large Breeds included! By submitting a photo, you agree that you own the exclusive rights to the image. All dog photos will be displayed on a breed appropriate page along with other pictures. Any information you share about your dogs, such as name or age will also be displayed. Be sure to check out some of my original dog art while you're here! I am an artist and a web developer, both of which I focus almost entirely on my love for dogs, especially rescue dogs! If you'd like to see your dog in a painting, be sure to let me know when you submit your photo. When I created the very first page of this website, it was with the intention of bringing awareness to the plight of rescue dogs. It is our plan to underscore their appeal and the appeal of of offering love to a deserving animal. In doing so we hope to vanquish the stereotype of rescue dogs being somehow inferior. They, in fact, are a better fit for many families. Learn why by checking our our Dog Adoption page! Have more questions on how your pet photo submissions help or a general question on how to submit the photo? Be sure to ask. 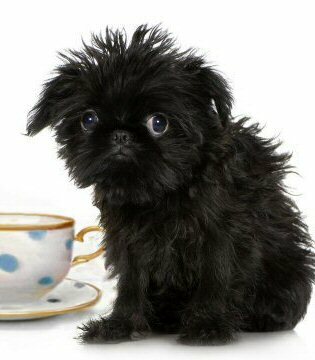 Looking For A Teacup Puppy? Looking for funny dog pictures and dog videos? Be sure to check out DogsGossip.com to see some of the funniest dogs doing the craziest things! Please consider adopting your new best Friend. Click here to learn all the reasons why dog adoption might be best for you. Copyright © 2014 Small-breed-dogs.com. All rights reserved.